I’ve been doing this blog for over 2 years and I had rashly promised I’d go back and update some of the previous entries. The thing is that there’s over fifty entries and I said summat that rhymes with “cluck bat” at idea of editing them. It then occurred to me that a simple solution would be a “best of” post, a 1970s Top Of The Pops type Top Ten thing without any of the dodgy touching up of young girls. 1 Don’t be a wee fanny I firmly believe this is the best city in Europe for a short break, it has culture, history, fantastic architecture and a beach. This means your trip can me as high brow or low brow as you wish. 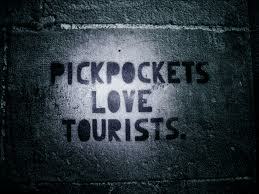 The only negative thing about the place is the pickpockets and robbers that are a blight on the town. It has to be said that the utter stupidity of many tourists makes their job pretty easy. If you follow my “Don’t be a wee fanny” advice you’ll be fine. Don’t carry a lot of money and cards, just take what you think you will need. Be aware of your surroundings, the city has a way of seducing you and as a result it’s easy to lower your guard. Simply ask yourself “would I do this back home?” I know people who have been robbed who have walked down dimly lit streets half cut with the drink, something they’d never do in their home towns. That advice is hardly rocket science but you’d be amazed how many people don’t heed it. 2 Just get on the damn bus As I mentioned above the city has everything and the very best way of seeing it all in as quick and convenient way possible is to take the tourist bus. 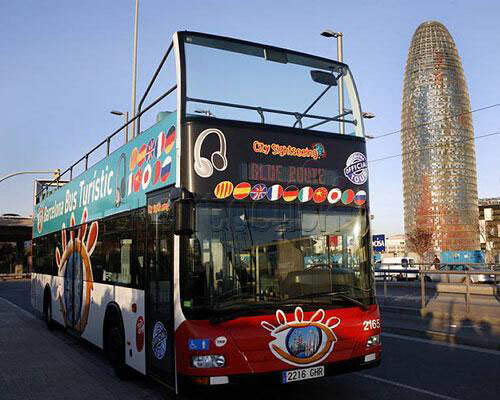 It will take you round all of the “must see” places and with the buses being every 5 or 10 minutes during peak tourist season then the “hop on hop off” facility is the how to do it. Depending on how long you are in city then the two day pass might be worthwhile. Alternatively if you just stay on the bus and decide what places you want to spend more time exploring. then buy a 10 journey ticket, T-10 for just under 10 euros and revisit your favourites using the cheap, clean and reliable public transport system. 3 Accomodation Where to stay, what to do? I did a Twitter poll a while back and asked people what they most enjoyed about their visit to the city. The majority of replies were about Barrio Gotico and wandering around there. Despite fact that I loathe the Ramblas and its environs (I’m sure Londoners would feel likewise about the obvious tourist areas in their city) it’s clear that people in the town for a few days love its colour, vibrancy and batshit mentalness. In that case it makes sense to stay in the area. I’ve found that the two best sites for hotels are booking.com and Trivago both have excellent search facilities and great deals on prices. The last thing I’d say is be realistic about what you need from your accomo, in most cases you really only need somewhere to shower and sleep as you’ll be cutting about the city when you are here. Is it really worth going for the four or five star option if you’ll only be using it to sleep off the food and drink? This entry was posted in Accomodation, Don't be a wee fanny, Getting around, Uncategorized. Bookmark the permalink.